A recent Albert Mohler program had touched on the subject of abortion in the movies. Hollywood is reluctant to carry out a storyline that includes a character that carries out an abortion. This is surprising in a country that widely supports abortion rights. However, it is not surprising for someone like me that believes that abortion is a great evil that will haunt the conscience of those who support and practice it. Abortion is so shameful and dreadful that Hollywood doesn’t dare create a movie that contains it. I can understand and share in the pain of being upset about the dying American soldiers and people of Iraq. Even more so, we should be upset about the injustice and shameful killing of multitudes more of unborn babies that are murdered on our own country’s soil and worldwide. There’s no lack of people to cry support our troops. But who’s crying support our children? Of course, it’s easy to muster up emotional vigor to support the troops that help protect our lives. We have selfish reasons for that. However, the same vigor is quiet when it come to support a defenseless child in the womb. This child has no voice to cry out for support. We must be that voice and if we don’t voice it, then the conscience will, and eventually God will on that day of judgment. One person called into the program telling how so many older and very godly women in the church had gone through abortions and experienced the unrelenting pain of their conscience. Their conscience soon found rest in the forgiveness they found in Jesus Christ. And how true it is! Through Jesus Christ, there is forgiveness for even the most heinous of sins. But some people may not come because of their hard hearts. However, the love of Christ can soften even the hardest of hearts so that they can find rest in Him. The world tries to tell us the freedom to choose is where true freedom lies. This is a lie. True freedom is found when you lack nothing and are in need of nothing. Only in Jesus Christ, can our souls experience true freedom and the lack of nothing needful. Come to Him and experience it. One of the best ways to improve the soil in a garden is to add lots of home made compost. 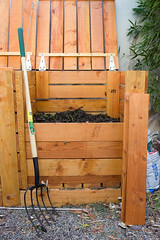 I started composting after attending a composting workshop provided by the San Jose City. They were selling plastic composting bins at 50% the retail price. The city was subsidizing the purchase of bins for San Jose residents. I made a couple batches of compost with the small little plastic bin and realized that I would need another bin or two in order to be able to have one pile of compost that is finishing while creating a new pile in another bin. So instead of buying more plastic bins, I decided to create a 3 bin system made out of wood. I found the plans in The Rodale Book of Composting. All 3 bins are connected to each other with lids, removable front slats, and a hatch for throwing fresh material into the first bin. Here’s a photo of 1 of the 3 bins. The 1st bin, on the far left, is for the fresh material. It’s called the holding bin. Once the holding bin is full, I move the contents to the middle bin and mix the proper amount of moisture, greens and dry material to get the composting action at it’s highest. My current batch stayed at 160 degrees for nearly a week! After it’s finished, I move it to the far right bin to settle and be used in the yard. Meanwhile, new material is continually added to the holding bin and the process can start again once the holding bin is full. I not only gather material from our yard and kitchen, but I also go out to the curb on trash day and pick up grass clipping and leaves that neighbors bring to the street. I just wheel my wheelbarrow out there and get the good stuff for composting. I’ve been reading that human urine is actually a very good activator for composting, so I’m also considering getting a little bucket to put on the side yard! Heck, it’s good for the compost bin and I don’t have to waste water flushing it down the toilet. What a double blessing! And of course, I agree with Albert Mohler and Martin Luther on this matter. Man should submit to the authority of Scripture and Scripture alone. Looks like the Roman Catholic church hasn’t moved an inch since the Reformation. They are still enslaved by their magisterial pride and traditions despite the teachings of Scripture. They have made themselves to be the modern day Pharisee. I removed the flickr badge that showed the latest photos on the sidebar. It was slowing down the front page and I think it might have been causing the front page not to load in some cases. Now, to see our photos at flickr, see the “My Space and Flickr” section of the right sidebar and click on the “Flickr” menu item.